I laid out the entire length of fabric to make sure I had enough for what I wanted to do. The lady at the store said 10 yards, but I wanted to be sure. Max held down the far end for me while I measured. How sweet. I had exactly 30 feet of fabric. 30 feet = 360 inches = four 90 inch panels. Perfecto! and measured 90 inches and cut...well, you get the idea. I cut out four 90 inch lengths. When you are unable to sew like me, you use the most wonderful invention ever made - Stitch Witchery! I got a double pack to have enough to go around all those edges. Then I used a handy little tool from the fabric store to measure my 'flap' that the iron-on webbing tape would slip into. The tape I got was 5/8 inches, so I measured the seam all the way down and ironed it flat. 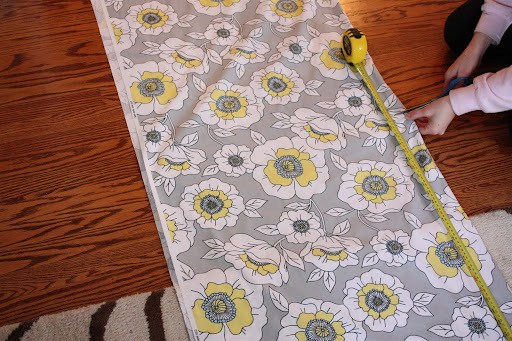 I also ironed the entire panel because no one likes displaying wrinkly curtains on their blog! TIP - sticking some straight pins right into the ironing board works great for holding down your seam before you iron it. I started with the long sides because those were the narrowest hems. After the fold was created, I slipped the webbing in there and ironed again. And no fair looking at my dirty bathroom. After the long sides were done, I turned everything clockwise and started on the top of the panels. Because my fabric was 90 inches long, and my curtains couldn't be longer than 85 inches to fit properly, I knew I would have a lot to hem on the top and bottom. For the top, I chose 3 inches and measured with my tool all the way down. Or until I got tired of measuring and just eye-balled it. Whatever rocks your socks. Then I ironed the seam flat, placed the webbing as close to the open end as I could, and ironed again. You can also leave the short 'sides' open and leave room for a rod if you want a 'pocket,' however I prefer rings for their ease of opening and closing, so I used the webbing on the short sides to make it stiff and hang nicer. Step 6 - Measure again before hemming the bottom of the panel! I say this because I messed up the second one. I still don't know how, but the second panel was shorter than the first, even though it started out the same length and I thought I'd hemmed the same amount on both ends. It's a mystery, like socks disppearing in the dryer and the Kardashians getting a tv show. Either way, I just reheated the webbing and pulled it apart to fix and redo. Problem solved! Aaaand, you're done! Clip your clean-edged fabric rectangle to your rings and then spend a few minutes just pulling them back and forth, admiring your work. Then go have some wine, because you deserve it! And then go look throughout your entire house to see what else you can hem or glue together with this amazing stuff! Great tutorial I never would have braved that one my own until now! I'm kinda afraid of all things related to window treatments... but I'm bookmarking this so that I have a shot at them. Thanks! Kim, that fabric measuring tool is the best. Sticking a pin in the end and then measuring every foot or so and pinning made a straight edge completely easy! And if you're off a little on the sides, no one will ever know. I also don't think I've ever purchased a set of curtains where the bottoms were all the same length! Aren't you a Clever Claire? My mom and I have always sewed together but her sewing machine broke and I've been thinking over buying cheapo treatments. But I think I want to give this a whirl! What a great idea! Great tips! I need to re-vamp some curtains soon. I love stitch witchery--I use it to hem my dress pants which are always coming un-hemmed. grrr! I love the iron-on hemming stuff. 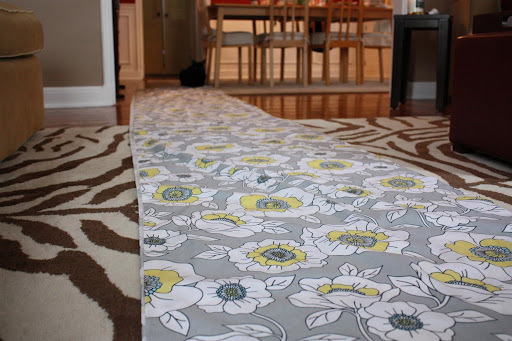 It totally came in handy when I made the fabric wall in our master bedroom! Never enjoyed ironing so much in my life!! Wowzers! This is awesome. We have a huge window in our guest bedroom that is in desperate need of something to replace the bed sheet that's currently hanging up (so college). 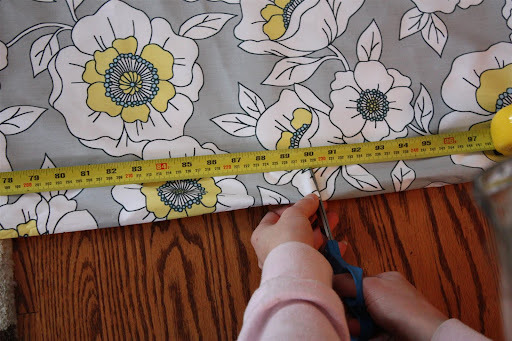 I haven't wanted to fork over big bucks for the extra-long window treatments, but I don't sew. Enter your "curtains"! I think I need to try this.... thanks!! What kind of hooks did you use at the top? and where did you get them? I am SO going to do this same thing... i just LOVE them! amazing! i LOVE LOVE LOVE the grey too! i'm obsessed. BTW: Did you think they looked like pajama pant material? 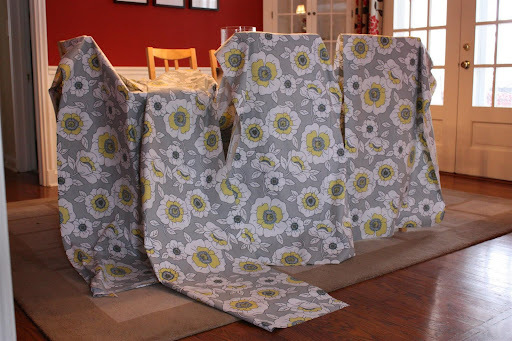 so nice to see a tutorial about how to make curtains that DOES NOT involve sewing. by the way, i totally wanted that rug at ikea. goes great with the fabric of your curtains and wall color. Hi! Looks great! Do you happen to know the name of the fabric or manufacturer??? Nancy, I'm sorry I don't. The name on the side of the fabric is 'Bag Girl' but I've googled it many times and haven't found anything. It was on mega-clearance at Joann's ($5 for a 10 yd bolt!) so it must be pretty old. Amy Butler has some similar designs, though.